One of the questions that a forex trader may ask is should I trade spot or futures? This article compares the differences between trading in the cash market compared to the futures market and looks at the pros and cons of each. When most people start trading currencies it’s usually in the spot or cash markets. It is an over-the-counter (OTC) market mainly supported by a collection of large banks. A key role in this is that of the market maker. The market maker performs a task analogous to that of an exchange. The market maker will buy from sellers, and sell to buyers, and as a result makes a market in the product being traded. A market maker publishes a two-way bid and ask price at which they commit to trade long or short. 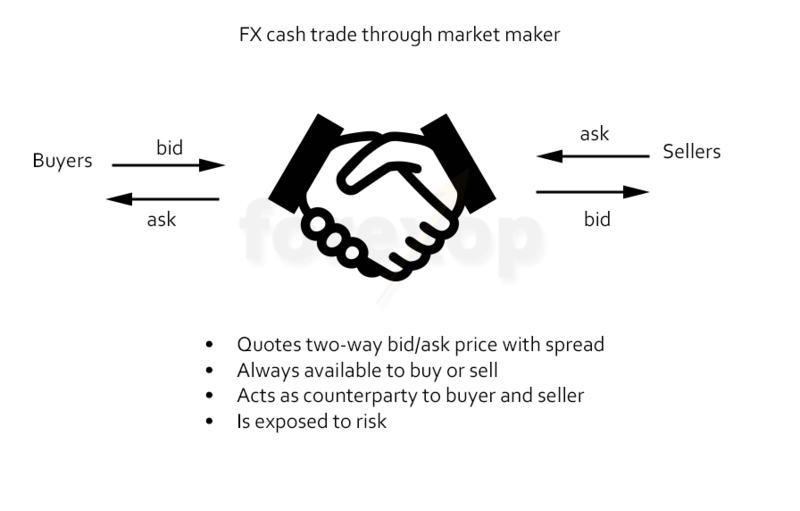 The spread between the bid and ask is a trading cost paid on both opening and closing a position and is where the maker tries to create profit. A market maker is always deciding an artificial price, even though that price is tied to the broader market and order flow. Unlike an exchange, a market maker will buy or sell even if there isn’t another side to the trade. Their trade book isn’t always neutral and they can have net long or net short exposure depending on the flow or orders. That means a market maker is exposed to market risk and that risk has to be compensated in their fees. In spot forex the market-maker is nearly always counterparty to the trade on both the buy and sell side. While the solvency of major banks isn’t a cause of concern, that can’t be said of some of the smaller lesser regulated providers that serve retail clients. In summary, an over the counter transaction is less transparent and more open to manipulation than is a similar transaction through a futures exchange. The mechanics of trading futures isn’t unlike trading spot currencies. If we look closer though there are some subtle differences. The original purpose of futures was to allow producers and receivers to lock in prices for commodities that would be bought or sold at a later date. Today exchanges offer futures trading in everything from oils, metals, softs to interest rates, currencies and even weather. The buyer of the futures contract agrees to purchase and the seller agrees to deliver a specified amount of the commodity at settlement. In practice most futures contracts are closed before expiry or are settled in cash. As well as the difference between delivery dates, the core difference between trading spot currencies and trading futures is that the entire transaction is handled not by a market maker but by the exchange. Unlike a market maker, futures exchanges broadcast buyer/seller quotes for each market they trade in. This offers a degree of transparency. Traders can see the flow of orders that the exchange is receiving. They can look at the most recent bid and ask prices for each contract and get an idea of market depth. In contrast to a quotation from a dealer, the exchanges’ quotes are actual prices buyers and sellers are willing to pay. But to make a profit, a market maker must create an artificial bid-offer spread. This spread can vary depending on market conditions. On the other hand most futures exchanges use a fixed-commission per contract. And the buyer and seller enter the contract at the same price, the mid-point between the bid/ask. The exchange’s fee includes the cost of trading and clearance. 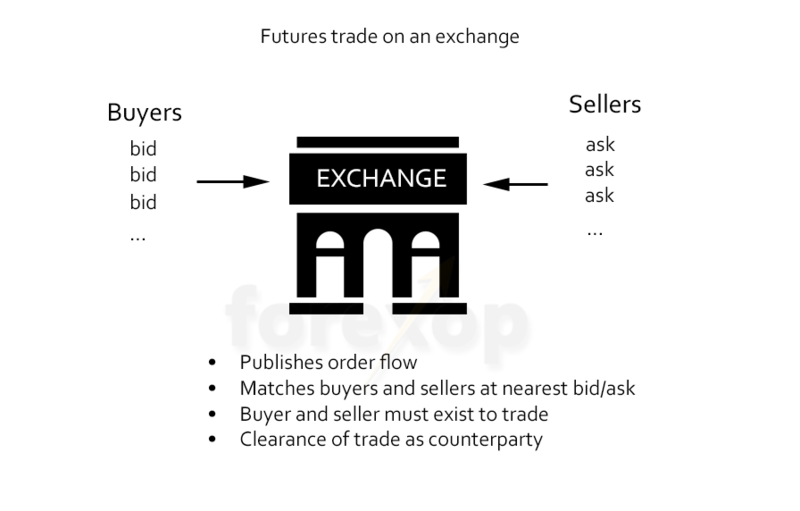 A futures exchange only matches an order when both a buyer and seller exist. On the other hand, the role of a market maker is to create liquidity and therefore they can take a trade even if there is no buyer or seller on the other side. In addition to improving transparency, trading futures also reduces counterparty risk. Counterparty risk is the risk of the buyer or seller not fulfilling their obligation in the contract. For a small transaction on a trading account this might not seem significant. But if a firm is hedging $300 million dollars of currency exposure then counterparty risk is a real matter. In a futures transaction, the exchange is always the counterparty to both sides of the transaction. In a spot forex trade, the counterparty is usually the market maker. If the trade is executed through a small FX broker, clients often don’t know how creditworthy the broker’s liquidity providers are or even know who they are. When trading futures through a broker, the broker has to be member of the exchange. Exchange membership demands strict margin rules and unlike spot forex brokers, futures brokers must be regulated. In the US the regulatory body is the CFTC. Most of those who trade spot currency will be accustomed with the process of rollover. Rollover is the practice of closing and reopening cash positions each night. This happens when a client wishes to keep a spot contract open indefinitely. It gives the impression of a fixed holding rather than a contract that’s due for settlement in two business days. On rollover, the buyer and seller of the spot contract settle any interest payments due. This interest is credited or debited to the trader’s account each night. Unlike spot trades, interest is priced into a futures contract itself by the market. This means, a futures contract will trade at a premium or discount to the spot rate depending on the difference in interest rates between the two currencies. When you trade a futures contract you pay or receive interest rates set by the market. But in a spot trade, the interest is set by the contract provider, usually the market maker. Retail traders usually have to accept significant markups/markdowns on interest paid and received respectively. The other matter to consider is that interest on spot trades due for T+2 settlements will be linked to overnight LIBOR rates. The interest priced on a futures contract will be according to the expiry. If the expiry is 12-months ahead, the interest for that contract will track the 12-month rate rather than the overnight rate as would a spot trade. This can make the pricing of longer dated futures contracts more sensitive to interest rate changes. Futures for physical commodities may also trade at a discount or premium to the cash market because of other reasons such as storage, supply and demand. Spread traders use a variety of strategies to exploit discrepancies between spot, futures and the different expiries. Among the useful reports that futures exchanges provide is that of open interest and volumes. Reports of open interest are necessary for transparency but they are valuable in their own right for trading decisions. Open interest means the number of contracts that are outstanding and have not yet expired or been closed. How the open interest is changing over time can tell you about the market sentiment. Trading forex in the cash or futures market has similarities and some differences. The transparency and reduction of counterparty risk makes futures a perfect choice for big players. When trading in several markets and with different instruments, futures traders can benefit from reduced margin due to SPAN rules. There are some downsides to trading futures as opposed to spot. FX futures markets have less depth than the spot market, especially in the longer dated contracts. The ease of access of spot markets makes them the preferred choice for the small trader and this is where many tend to gravitate. Whether you trade forex in the cash or futures markets, much remains the same including the technical and fundamental analysis of the market, and the need to select a reliable broker. 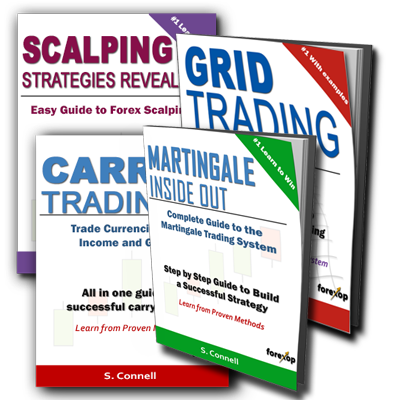 Four complete and up to date ebooks on the most popular trading systems: Grid trading, scalping, carry trading and Martingale. These ebooks explain how to implement real trading strategies and to manage risk. Europe’s Banking Sector: A New Crisis? Selling Options: How Much Margin Do I Need?